When it comes to the right tool for the job, those of us who cook day in and day out settle into strange habits. In the privacy of our homes, we make do with what we have. Were the light of day to truly shine in most kitchens (which, in my imagination, means the lights and cameras of a reality TV show) it would reveal a batterie de cuisine of scarred plastic mixing bowls, rusty vegetable peelers, and dented measuring cups. Some kitchens don’t even possess baseline necessary equipment. When I lived alone, I could not bring myself to buy a box grater. If I wanted a quesadilla, I had to scrape cheese over the arc of holes in my food processor’s grating disk. My sister avidly follows the recipes of such luminaries as Dorie Greenspan, Marcella Hazan, and Diana Kennedy. Yet despite her hard-won culinary chops, ownership of a soup ladle was a luxury that somehow eluded my sister until recently. Now I kind of miss the days when she would call to say that she had made a pot of soup, but didn’t know how she was going to serve it. But the queen of kitchen-tool deprivation is our friend Kim. In much the same way an infant reaches for its mother when hunger pangs grip its little stomach, Kim is known among a certain set of artists, workaholics, and single men for her nurturing dinner parties. When they haven’t had a proper meal in a while, they secretly hope for the call inviting them to her groaning board of pastas, salads, brisket, and barbecued chicken. Go to help Kim in the kitchen, though, and you may not find a pair of tongs to turn the meat on the grill, or a rubber spatula to scrape coleslaw dressing out of the bowl. I have seen whisks in her kitchen with such big gaps between the wires that they could move through a bowl of marbles with little resistance. Yet every summer, Kim celebrates life with rosé, grilled vegetables, and bowls of garlic aïoli she has managed to emulsify with only her ghost of a whisk and the motion of her wrist. Eventually, Kim’s regular guests saw what needed to happen and began leaving things behind after potlucks. Whether this was a subliminal or a conscious decision I’ll never know, but Kim still cherishes the two-quart liquid measure with a lid, perfect for storing pancake batter, that someone “forgot.” A close friend presented Kim with a brass pepper grinder and a set of chef's knives in recognition of years of meals and late-night talks. And two years ago Kim's partner, also famously thrifty, finally broke down and bought a set of measuring cups. We cannot all be aïoli savants like Kim, able to fill in with skill when our tools are sub-par. I know that she, too, appreciates the boost well-made tools give to those cook. So I say, enough with making do! Evenings out aside, it's the home cooks who really feed and comfort us, without benefit of the restaurant chef’s walk-in refrigerators, industry discounts, or crew of prep cooks. It's the home cooks who need and deserve equipment to brighten mundane tasks. 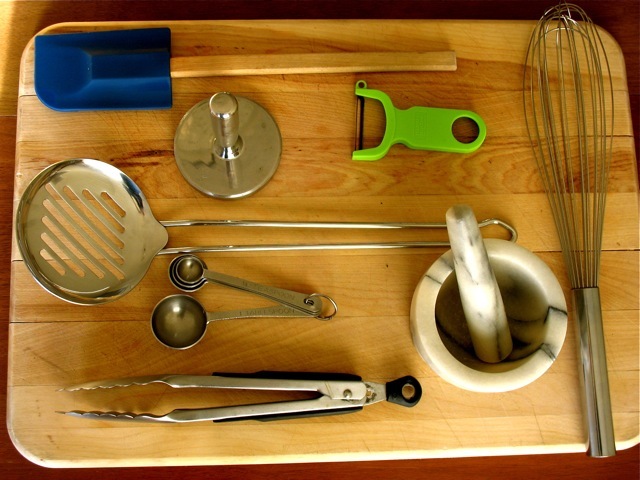 Here's my list, then, of low-tech kitchen utensils and small-scale equipment that I find useful on a regular basis. I’ve focused on the tools professional cooks rely on that home cooks don’t always have, as well as gifts of particular versatility. I’ve also included items that wear out frequently or are always needed. As you shop, look for objects that appeal to the senses. Cooking is a tactile craft, and natural materials like wood, marble, and ceramic are pleasing to handle. How utensils, bowls, and pans feel when you hold them matters; they should look attractive and feel comfortable enough in your hand for sustained use. h4. [%amazonProductLink "Cast-iron tortilla griddle" asin=B00008GKDN newpage=true]. It’s round, flat, and 10 inches in diameter, with an offset handle. As its name suggests, a cast-iron tortilla griddle ($13-$25) is perfect for heating tortillas, flatbreads, and day-old pizza. A tortilla griddle has no sides, just a slight lip around the edge, making it easy to flip pancakes and quesadillas. 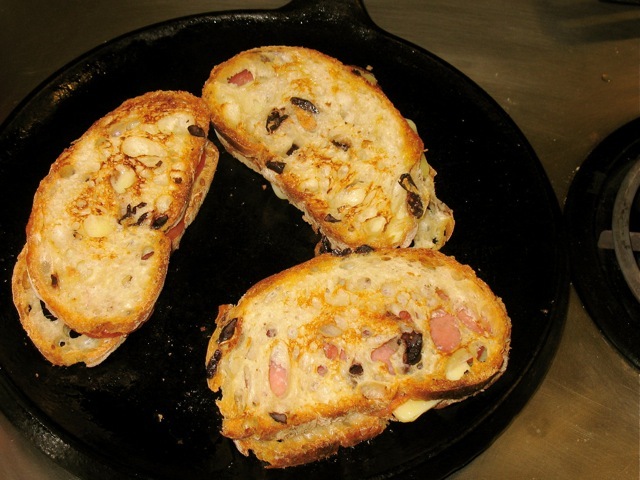 The heat of the solid cast-iron gives grilled cheese sandwiches an especially crunchy crust. h4. [%amazonProductLink "Dutch oven" asin=B00004SBH4 newpage=true]. At $50 and up, depending on size, the Dutch oven is about the priciest item on my list, but it’s essential. Sometimes called a rondeau or a brasier, this is a wide pot with a heavy bottom, two handles, and a tight-fitting, ovenproof lid. Although it performs well in a range of uses, from rice pudding to roast chicken, the Dutch oven is the pot for braising. You can brown on the stovetop, braise in the oven, and serve from it at the table. The rondeau, technically wider and lower than the Dutch oven, is used constantly in professional kitchens. Its surface area provides ample room for searing and browning. Meats and vegetables can be braised in a single layer with minimal liquid, concentrating flavors. It's ideal to have both a smaller (starting at 2 quarts) and a larger Dutch oven (up to 13 quarts). Dutch ovens should have a non-reactive surface, either stainless steel or enamel, and a thick aluminum or cast-iron core. h4. [%amazonProductLink "Mortar and pestle" asin=B000GG6EDK newpage=true]. The mortar and pestle ($10-$50) is a magical flavor generator. I use mine to mash jalapeños for chutney, crush black peppercorns and toasted spices for dry rubs, and smash garlic, thyme, and lemon zest to a paste for marinades and vinaigrettes. Mortar and pestles come in a variety of sizes and materials (stone, granite, wood, marble, and metal). Get a larger mortar and pestle if the recipient will be making pestos and salsas; besides, a big one sitting on a counter will make the kitchen look all slow food. h4. [%amazonProductLink "Microplane grater" asin=B00004S7V8 newpage=true]. Here’s a tool that regularly elicits a “Wow!" from first-time users. Originally a woodworking tool, the microplane grater or zester ($10-$15) is super-sharp and can turn citrus peel, nutmeg, chocolate, and Parmesan cheese into piles of fine shavings with little effort on the user’s part. Get one with a plastic handle for gripping. Wider models come with medium and large grates for cheeses softer than Parmesan. A mandoline contains interchangeable blades that allow you to do things that would otherwise require advanced knife skills and tons of patience. With a mandoline you can julienne carrots into matchsticks and slice potatoes see-through-thin for gratins. Stainless-steel mandolines are expensive; I recommend the plastic ones instead, which you can get for about $35 apiece. Make sure it's adjustable for thickness and comes with a guard. The most effortless peeler I’ve used. Priced as low as $4 each, you want to get two of these lightweight tools. The broad blade is sharp and flexible, and easy to pull over curvaceous produce like pears, apples, and potatoes. Some Y-peelers have ceramic blades, which do not rust; for these, you'll pay $15 to $20. The Kershaw is the sharpest, and therefore the safest, bread knife I have ever used. People get cut when dull bread knives slide and skip over hard bread crusts. At the restaurant where I work, the cooks and waiters covetously hide the Kershaw bread knives from each other. Hot soups leak out of food processors and threaten to blow the lid off blenders. Why try to transfer soup when you can purée it in its pot? There's less to clean up with an immersion blender ($30-$200, also called a stick blender) and you can use it whiz smoothies, sauces, and salad dressings. h4. [%amazonProductLink "Meat pounder" asin=B0000DZCJ7 newpage=true]. With a little muscle on your part, meat pounders ($15 and up) transform otherwise dense and chewy cuts of meat, such as pork leg and veal top round, into very thin discs, a k a scaloppine. Thusly subjugated and briefly sautéed, tender scaloppine are an excellent introductory fork-and-knife food for the younger set. And everyone likes saltimbocca. That said, I use my meat pounder almost exclusively for prepping garlic. I knock open the bulbs, tap the cloves to loosen their skins, and smash the peeled cloves, cutting my chopping work in half. A pounder also comes in handy when you need cracked black pepper. Or use it to crush slices of dried toasted bread into crunchy, irregular breadcrumbs. And remember, the heavier, the better; you want yours to be at least 1 1/2 to 2 pounds. A crock of these basics makes a fabulous host gift. [%amazonProductLink "Spring-loaded tongs" asin=B0000DZCJ7 newpage=true] act like pincers or extensions of your hand; they're indispensable for turning and moving food in the skillet and on the grill. The ones that have a lock to hold them closed are easiest to store. Get two, a 9-inch and a 12-inch. Besides folding in egg whites and cleaning out bowls, use heat-resistant silicone spatulas and spoons to stir sauces over heat. The best are quite flexible, so you can scrape out corners. They come in an array of colors, even glitter, and some have wood handles. Slotted spoons are vital for fishing solids out of liquid. I use mine to scoop out parboiled vegetables, especially when I want to save the vegetable-poaching water for a soup stock or a pasta; cooked in said water, a batch of pasta will absorb the flavors of the vegetables. The best whisks have curved wood handles and lots of thin, flexible tines. These can be found at restaurant-supply stores, some of which are open to the public. Buy a set of wooden spoons, which are now available in such luxury woods as burnished bamboo, olive wood, and red beech wood. Make sure to include one with a straight edge for scraping up the brown bits at the bottom of a pan. Buy these for yourself or for someone you know needs them. You can’t beat the stainless-steel prep bowls used in restaurants; they're durable, lightweight, and unbreakable. On the other hand, cheery colors are a nice touch for these vessels of scut work. A certain celebrity chef has a line of melamine prep bowls in colors like persimmon, pesto, and espresso. Prep bowls are also available in heat-resistant silicone; many have measurement marks on the sides. Usually made of glass or ceramic, mixing bowls are a more substantial version of prep bowls. Bakers who stir, mix, and fold by hand rely on the stability these heavy bowls provide. Vintage or new, mixing bowls are typically good-looking enough to make it out of the cupboard. I use mine to store onions and display fruit. Thanks to Helen Rennie’s advice about buying an affordable chef’s knife and keeping it sharp with a $10 handheld sharpener, my sister is now a slicing-and-dicing whiz. Baking is more fun when your measuring tools don’t bend, dent or melt. Buy a good set of heavy stainless measuring cups and spoons. Don’t let anyone from the just-make-do contingency convince you that you can accurately measure liquids with dry cup measures. The best liquid measures are made of microwaveable glass and have a handle and a pour spout. Buy two. I rarely use my digital thermometer, but it’s good to know I have technology on my side when I roast a ham or leg of lamb. Oven thermometer and pizza stone. This makes a good pair of gifts for someone who likes to bake, but may struggle with an old or uneven oven. Both stay in the oven at all times. The thermometer tells you if what you think is 350 degrees is actually 325; the stone holds heat, helping the oven bake evenly and recover its temperature after the door is opened. Many of the gifts I’ve suggested — the humble wooden spoon, the quotidian oven thermometer — aren't exactly holiday scene-stealers. But I assure you, those who cook and host will appreciate your recognition of their time spent at the stove. If you’re still in doubt, round out your gift box with the small items that every kitchen and table can use: beautiful kitchen towels and pot holders; tile, bamboo, or cast-iron trivets; a matching set of serving utensils; a salt cellar and pepper grinder; cloth napkins; and candlestick holders.